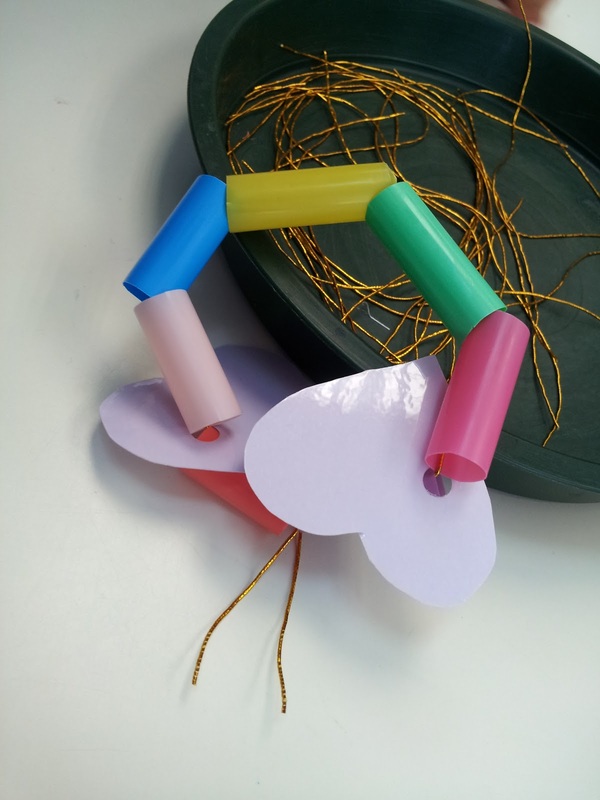 Yesterday I was invited to my younger son’s school for their Mother Day’s celebrations – ‘Mother’s Day Carnival’ as the invite card said. Judging by the previous year’s celebrations I knew they would be doing something special for us and I was quite looking forward to it. But I had absolutely no clue about what was in store for me! As I reached school, I noticed a lot of mums waiting at the entrance. Now this was a change from last year as that celebration was only class-specific and not for the whole school! 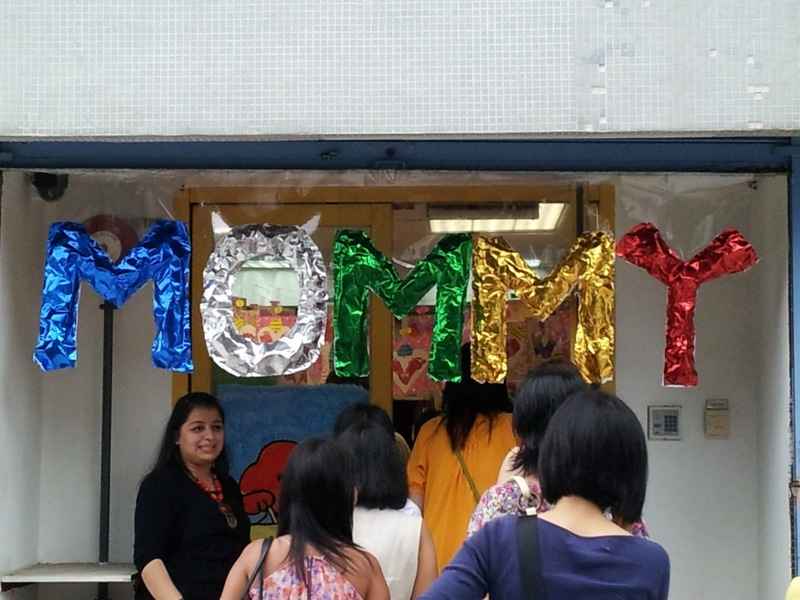 At the entrance there was this huge banner put up saying “MOMMY” which felt very welcoming and as I later found out was hand made by the children, each of the five letters being assigned to a different class. 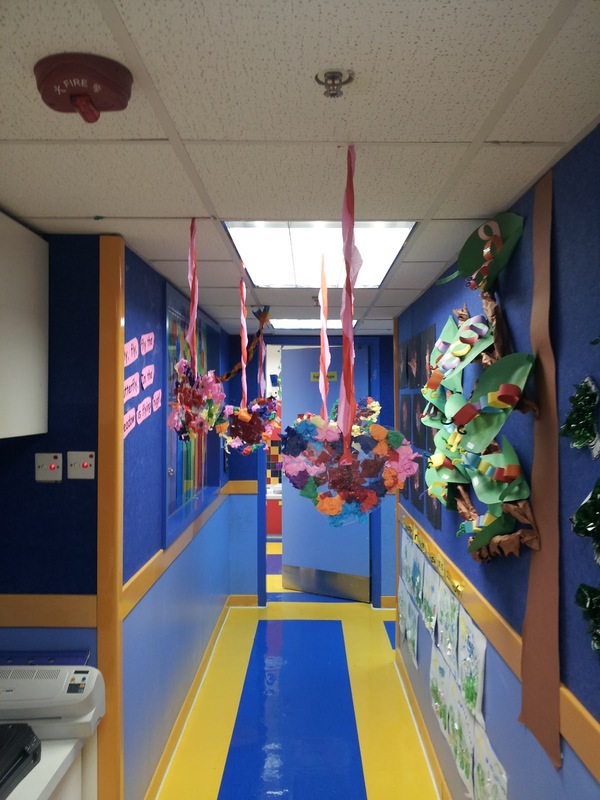 As we entered the school there were more arts and craft on display. A giant heart with the children’s photographs with each child holding a self-written ”I love you” sign, big heart cut-outs using foot prints of each child and gift hampers for all us mums, which included a bouquet of roses and a giant paper hand bag with quite a reasonable price tag I must say! The big Sale for Mummies! Considering all these show-stoppers, there was a bit of a jam at the entrance with all of us pulling out our cameras and taking photographs of this ‘art gallery’. The fun had begun and we hadn’t even reached our kids yet! My son gave a leap of joy and came running into my arms as soon as he saw me. I was on cloud nine already with all the hearts surrounding me and lapped up this extra bit of attention. We were then asked to sit down and relax and wait for the pampering session to begin. Suddenly out came the body lotion bottles and my son obviously well-trained by his teachers took generous amounts in his tiny palms and applied it on my hands and back ready to give me a much needed body rub. 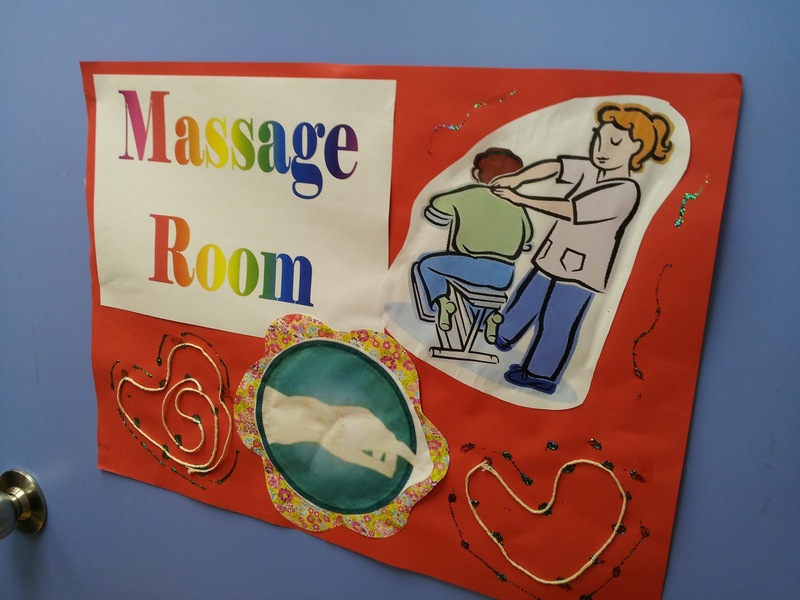 Apparently that wasn’t all as after ten minutes we had to shift tables and the kids were given small hand vibrating massager and were instructed in how to use them to massage our backs! I highly recommend this crash course in massaging given by the competent school teachers as my son was a complete expert in it! He made me lie face on the table and started with my neck going all the way down on my back with this wonderful-wonderful invention. Oh I was in heaven and said a silent thank you to the supervisor of the school who I figured was the mastermind behind all this! After ten minutes when we were asked to move on, I was quite reluctant to leave. That’s when I saw the sign on the door Massage Room…..aaah! We were then asked to proceed along with our child to the next room which was another big suprise! 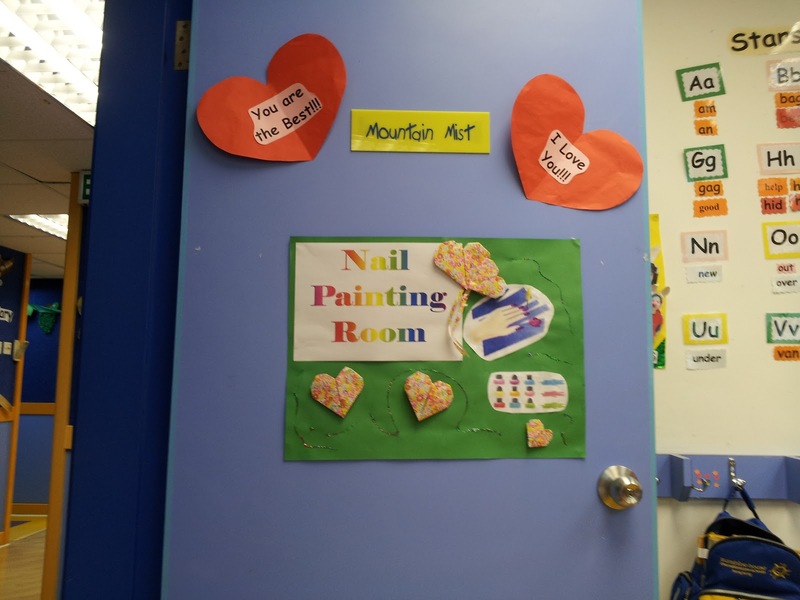 The nail painting room! Now I am quite terrible when it comes to pampering myself. I always have something more important to do than a pedicure or a facial. So getting all these small treats and from who better than my own son was a luxury better than any spa could offer! 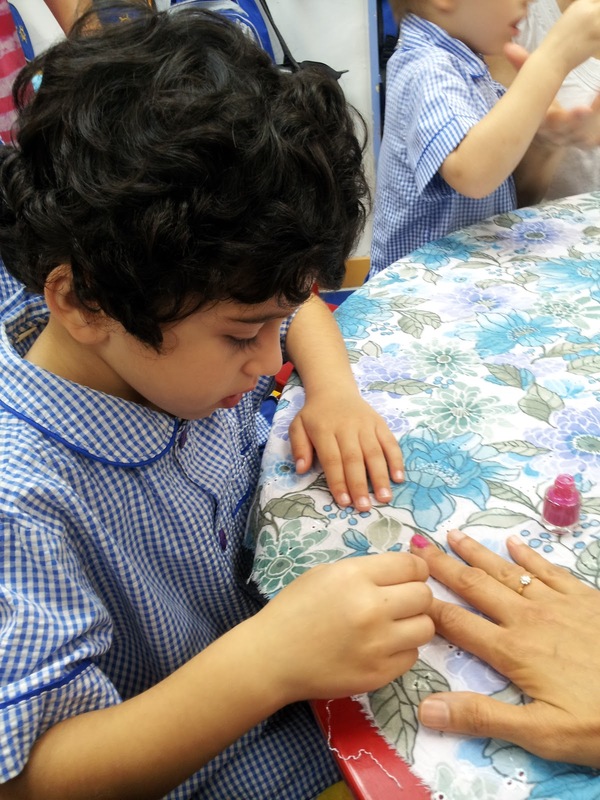 He decided on the colours purple and pink and started painting my nails very carefully, as careful as any 5-year old boy can get. He even insisted on taking a photo of my nails afterwards. The service was complete only after he insisted on letting out big puffs to dry the polish as quickly as possible! The next stop was the Photo Room. This again was a brilliant idea where we had to pose with our child while an instant camera clicked a picture AND let out the print instantly! 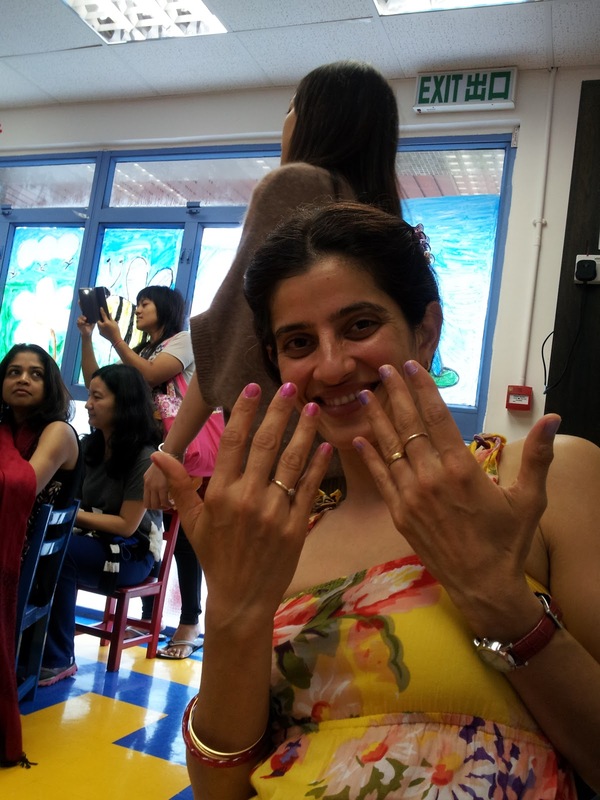 This was the quickest session and gave us mums a chance to chat after the deed was done while the children were kept busy with toys. 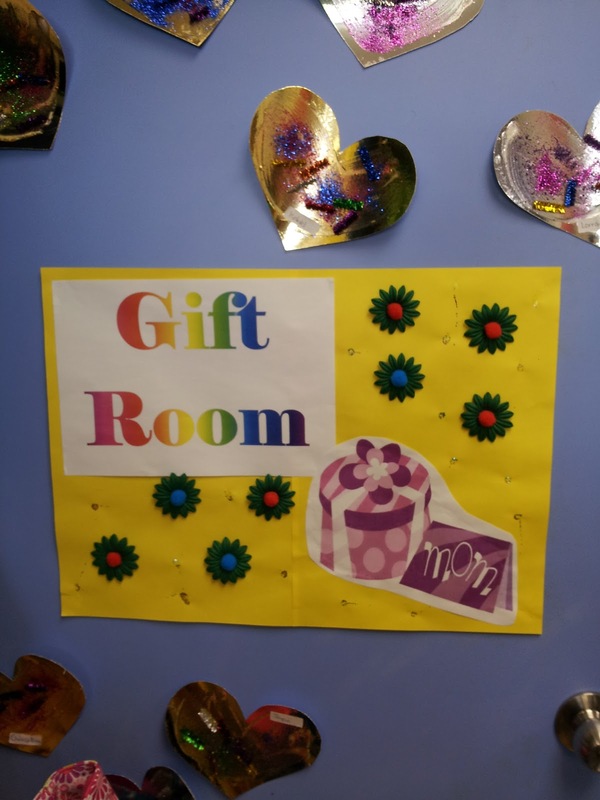 The next stop was the Gift room where my son and I got busy making a pretty bracelet for myself. It was quite difficult to keep the strand still and thrice after almost-completion the thread slipped and we lost all our beads! It was finally completed with the help of a teacher after which my son customised it with our names! 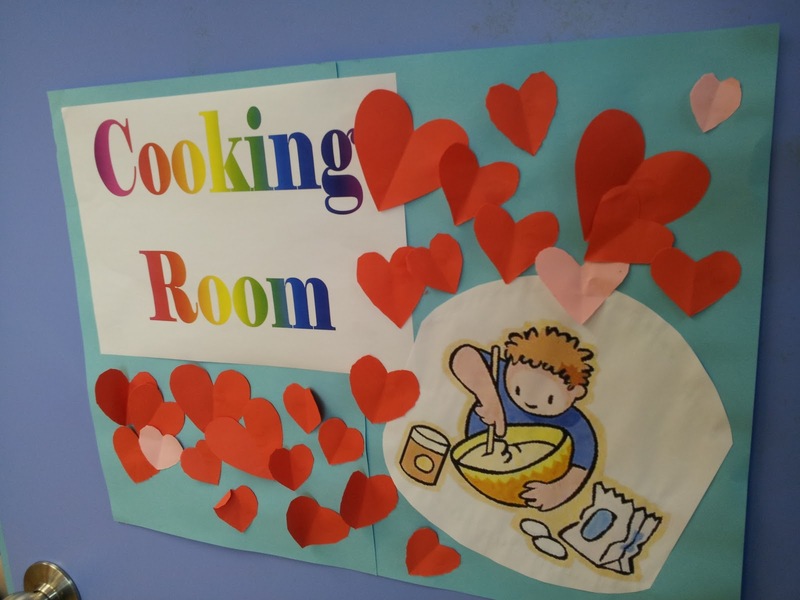 The last stop was the Cooking station, where heart-shaped cut out bread, jam and sprinkles were kept ready for the children to make and hopefully feed their mums. It started off well with my son very carefully spreading the jam on two slices and then putting in as many sprinkles as possible. When I told him that I don’t want so many sprinkles there was no response. By the time he finished and I was ready to eat, the bite-sized sandwich was neatly popped into his own mouth while his other hand reached out to make one more. I grabbed that in time and bagged it to save it for his elder brother. I think most of the children were stuffing their little mouths while hungry mums were picking up the crumbs! After that we were taken back to his classroom where we got set to leave. But hold on there was more! 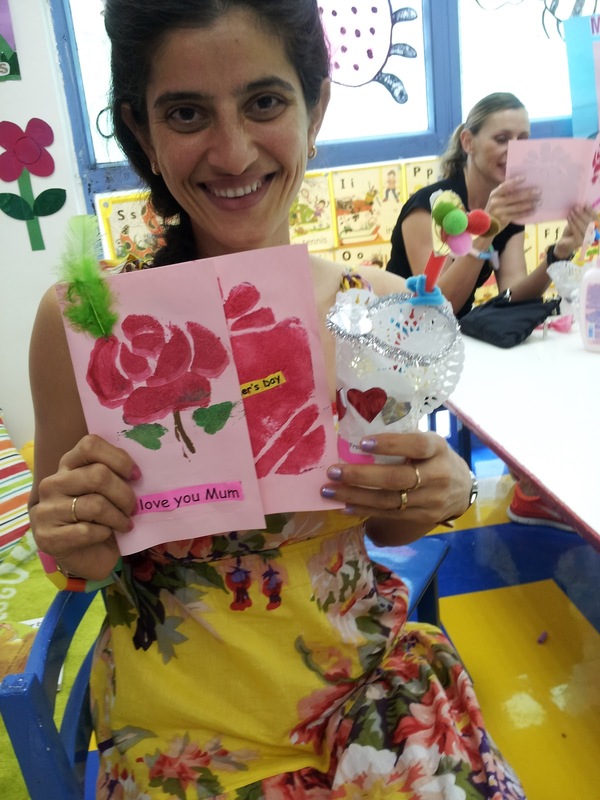 Each child had prepared a small gift for his/her mum – a hand-made card and a bouquet that my son very happily handed over to me. That was icing on the cake! I loved it! 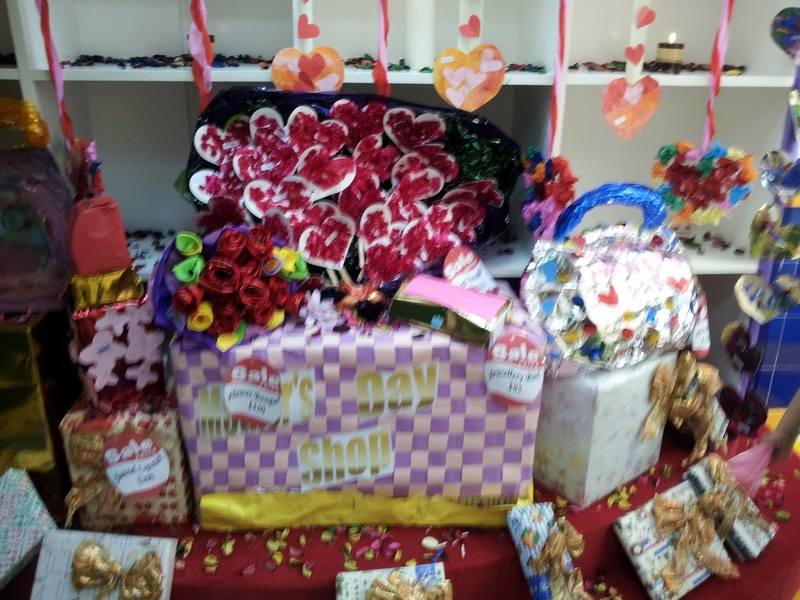 There was no doubt in my mind that this was the best Mother’s Day celebration ever for me and just before leaving I gave a big hug to the brain behind this master plan – to the supervisor of the school for all her creativity and hard work to make this such a big success! Happy Mother’s Day to all you lovely mums out there and a big Thank you to Anna Jarvis who thought of this novel way way to honour mums all over the world! 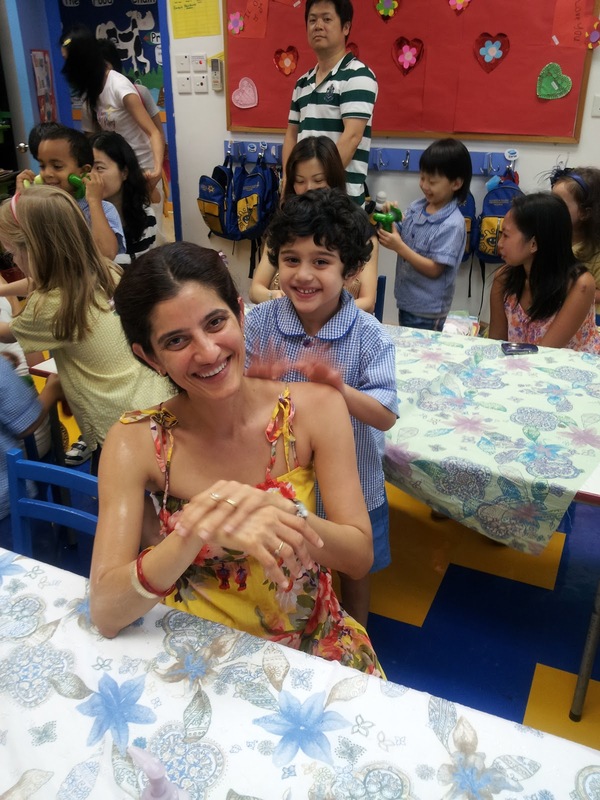 All good things come to an end – Graduation day! All set for BIG school now!